In recent years the hybrid-Trefftz finite element (hT-FE) model, which originated in the work by Jirousek and his collaborators and makes use of an independently defined auxiliary inter-element frame, has been considerably improved. It has indeed become a highly efficient computational tool for the solution of difficult boundary value problems In parallel and to a large extent independently, a general and elegant theory of Domain Decomposition Methods (DDM) has been developed by Herrera and his coworkers, which has already produced very significant numerical results. Theirs is a general formulation of DDM, which subsumes and generalizes other standard approaches. In particular, it supplies a natural theoretical framework for Trefftz methods. To clarify further this point, it is important to spell out in greater detail than has been done so far, the relation between Herrera's theory and the procedures studied by researchers working in standard approaches to Trefftz method (Trefftz-Jirousek approach). 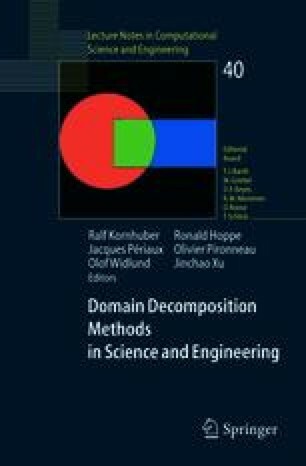 As a contribution to this end, in this paper the hybrid-Trefftz finite element model is derived in considerable detail, from Herrera's theory of DDM. By so doing, the hT-FE model is generalized to non-symmetric systems (actually, to any linear differential equation, or system of such equations, independently of its type) and to boundary value problems with prescribed jumps. This process also yields some numerical simplifications.